Tica Darie is a 22-year-old Romanian changemaker, who is proposing and building the path of sustainable development for the mining town of Rosia Montana, which has recently been a battlefield between a Canadian mining company and Romania’s citizens. The Canadian company, Gabriel Resources Ltd., was planning to use 40 tons of cyanide a day to exploit the around 314 tons of gold squirreled away at Rosia Montana through an open-pit mining project, destroying four forested mountains, contaminating multiple rivers and communities living around them, while leaving the enormous task of rehabilitating the exploited area mostly to the Romanian authorities. When Romania’s government passed a draft law approving the company’s initiative, the general public took for several weekends in a row to the streets of Bucharest and the diaspora to protest against its decision in the largest demonstrations that the country had witnessed since the fall of communism. While the project has been placed on standing, many of its proponents argue that gold mining nevertheless remains the only solution for this impoverished area in Romania. The fact that the area was declared monoindustrial, meaning that it is exclusively focused on developing mining activities, renders it difficult for alternative economic initiatives to be launched. Still, there are people determined to prove that through hard work and determination, Rosia Montana can carve a clean and safe future for itself that is not based on mining. By launching a traditional knitting business, Made in Rosia Montana, which already engages and provides additional income to thirty local ladies, Tica Darie is one of the individuals working hard to build Rosia Montana’s prosperity and prove the detractors wrong. While originally from Suceava, Tica moved to Rosia Montana, after studying multimedia design in Copenhagen. He has been living there for one year and a half in the small time. As soon as he moved, he noticed that, while some locals ardently supported the mining project, many people in the community focus on activities that allow them and their families to survive, but do not generate employment for others. The young Romanian began thinking of activities that could generate additional income for the locals. After considering multiple ideas, the one that he eventually chose to implement came to him rather unexpectedly, when one of the local ladies knit him a pair of woolen socks to keep him warm after his return from the hospital, where he was hospitalized with tonsillitis. Tica loved the socks so much that he decided to share them on Facebook. In less than two days, 100 orders had been placed. He didn’t know what he would do to fulfil such a large order of socks. Although New Year’s Eve was right around the corner, they managed to mobilize themselves, bought additional wool and brought together other women to knit the socks. 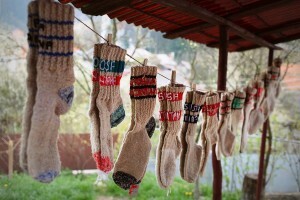 In the end, they had to honor orders for 300 pairs of socks, but didn’t make a profit, because Tica, plunging into his first entrepreneurial initiative without any previous experience, had not taken into account the cost of wool, packaging, transportation, or anything else that should have impacted the price of the pairs of socks. Without changing the price, he and the ladies honored all the requests received. 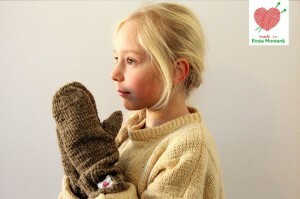 Since then, over a year of organizing passed until in early 2015, Tica and his team opened their online shop with the woolen products, which are sold throughout the country. Apart from the thirty ladies, who are already part of the business, many more want to be involved in knitting. The wool that Made in Rosia Montana uses for its products is brought from a sheep herd in Vrancea County in Romania. The herder contacted Tica directly, because he wanted to be involved in supporting his initiative, after reading about it in a magazine. The wool is subsequently processed in Brasov County, before being brought to Rosia Montana, where, with the talent, care and hard work of the ladies involved, it is transformed into high-quality hand-made products. While some locals have discounted his initiative, the overall response to it has been overwhelmingly positive, as national television states, online press, blogs, Facebook and other social media, as well as even a Hungarian television station has shown interest and support for this initiative. Tica confesses that this outpour of support motivates all those involved to keep developing the business and organize themselves even better. Despite the outpour of support, Tica admits there have also been some significant challenges in starting Rosia Montana, the greatest of which was building everything from scratch and entering the world of entrepreneurship, which was completely new for the young Romanian. Open to learning, he and his team of knitting ladies have not only established an online product magazine with hand-made wool products, but built an entire volunteer community working hard to support the business’ development. On the short-term, Tica and his team intend to create a full-fledged business plan, while, on the long-term, they would like to establish contracts with stores in Romania and abroad and develop a wool spinning center in Rosia Montana. Apart from running and developing Made in Rosia Montana, Tica also launched in October 2013, with the help of some of the Rosia Montana locals, a local scout center to contribute to prepare children and youth through non-formal training to become responsible citizens. Everyone involved in this project, including himself, volunteers their time during the week and weekend to ensure the center’s successful activities. Even before moving to Rosia Montana, Tica was involved in raising awareness and preventing the Canadian company’s mining project, as he strongly opposed the use of cyanide, the mountains’ destruction and dismantling of local communities. Some of his key initiatives included bicycling through Europe twice from Copenhagen to Rosia Montana, first along in 2012 and subsequently with a young German woman in 2013. He has held conferences on Rosia Montana in over ten European cities, while also running marathons and ultramarathons to draw attention to the town. Tica has also documented, through video, key events for the town, which played a crucial role in informing Romanian citizens about the activities of the Canadian company and of local and national authorities on the matter. While his role in supporting the Rosia Montana movement was important and diverse, Tica modestly confessed that he only brought his small contribution, just as many people who became directly or indirectly engaged in saving Rosia Montana. While optimistic about the town’s future, the young entrepreneur emphasized that, in order to allow its development to head in different directions, Rosia Montana must be freed of being a monoindustrial area, with mining at its core. One of the aspects that he believes has the most potential is tourism, which should emphasize 150 km of pre-Roman and Roman mining galleries. According to the ‘Statement of Significance. Carnic Massif, Rosia Montana’ published by Oxford University experts, the mines at Rosia Montana should be recognized as a UNESCO World Heritage Site, as they are the most extensive and important underground Roman gold mines in the world. The Oxford publication further argues that Rosia Montana possesses an invaluable and detailed record of Roman, medieval, modern, and communist-period mining exploitation, comprised not only in the mining galleries, but also in the surface landscape of ore processing areas, settlements, religious places, and cemeteries. Tica believes that, in order to develop Rosia Montana, locals have to take attitude, by pressuring local and national authorities to support alternative initiatives.